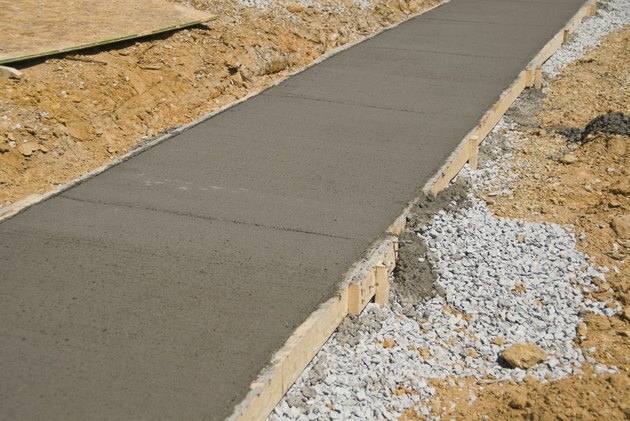 Concrete is one of the best options for laying a new driveway, walkway or a foundation for an extension or shed. However, ordering concrete -- which includes the cost of the materials, the prep and the installation -- can be very expensive. There are a number of ways to save money if you make some different choices or are willing to put in a little sweat equity yourself. Laying concrete can be an expensive job. One of the least expensive ways to get concrete is to mix your own. You can buy bags of the mix from a home improvement store. Typically, you only have to add water for it to be ready to pour. However, it is important to get the ratio right and to mix the concrete thoroughly. Otherwise, you risk getting a weaker concrete once it cures, which could lead to cracks or crumbles within a couple of years. Consider renting a truck, since mixing the bags one at a time limits your ability to get consistent results. You don't have to buy the very best concrete available to get good results. You can get cheaper concrete by purchasing sub-grade concrete. This usually is available at salvage yards and is clean material. Therefore, you don't have to worry you're not getting quality material. You'll save a lot of money on concrete, and you'll be doing your part for the environment by using reclaimed materials. If you are lucky enough to have some neighbors who also are interested in laying some new concrete pathways or a driveway, you might be able to save some money by putting together a bulk order. Check with local suppliers to find out if such a discount might be available, and if so, how much you would need to order. Sometimes, the convenience of sending out one truck to one location for multiple orders is enough for a supplier to knock something off the price. A lot of the cost associated with ordering concrete is the prep work involved. Depending on the tools you have at your disposal and how much physical effort you're prepared to put in, you could excavate the space, lay down the frame, or grade the area. You also could put in work helping to spread the concrete or texture it. Ask your provider what kind of discount might be available for the amount of work you are willing to put in. You might be able to bring the cost down significantly.